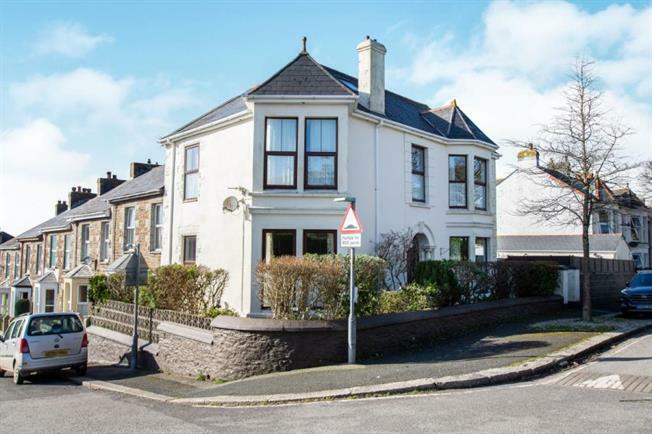 4 Bedroom Semi Detached House For Sale in Redruth for Offers Over £320,000. A unique opportunity to acquire this extremely spacious home within the popular area of Albany Road. The property is currently being run as a Residential Care Home. Internally, the accommodation is laid out over three floors and comprises an entrance hall, sitting room/ground floor bedroom, lounge, dining room, large kitchen, utility room and shower room. To the first floor there are four bedrooms and a good size master bedroom. There are two further rooms on the second floor currently laid out as a bedroom with an en suite and a lounge. There are delightful views from here. There is a lovely paved courtyard and a detached garage. The property is double glazed and has gas fired central heating. Stairs to the first floor. Radiator. Doors leading to two reception rooms and further archway to rear of hall and doors to dining room and kitchen. Double glazed bay window to the front. Radiator. Ceiling cornice. Side box double glazed window. Radiator. Double glazed window to the side. Cupboard with recess to either side. Picture rail. Double glazed window and doors sliding to the garden. Fitted with wall and base units with work surfaces. Undercounter space for fridge/freezers. Space for washing machine and dryer. Radiator. Double glazed window. Shower cubicle. Wash hand basin and low level w.c.
Stairs leading to Bathroom. Further stairs leading to the bathroom. White suite comprising panelled bath, pedestal wash hand basin and close couple w.c. Radiator. Walk in shower cubicle. Double glazed window to the side. Tiled walls. Cupboard. Further to door leading to a room with stairs leading to the second floor. Double glazed window to the front. Radiator. Stairs to the second floor. Double glazed box window to the side. Radiator. Access to both rooms. Storage. Double glazed window to the side and sky light. Radiator. Built in cupboards.. Beams. Views across Redruth and Carn Brea Castle and Monument. plus dressing area. Two sky lights. Radiator. Shower cubicle. Close coupled w.c. Wash hand basin. Sky light. Tiled walls. Enclosed paved area with decking and raised flower borders. Outhouse housing the boiler. Gate leading to the front of the property. Access to the garage. Light and power connected and further storage within the roof space.